At this point in time, while we were being treated to all sorts of rock music and the emergence of heavy metal, Frank Zappa was quietly churning out several albums a year. In 1981, he put out three albums and I intend to visit at least one of the other ones as well. However, for me in this year, “Tinseltown Rebellion was the standout album. Like with the vast majority of his albums, Frank always brings that unique blend of humorous lyrics along with master craftsmen like musicianship. 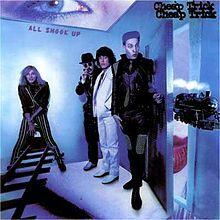 There is plenty of it in this album and the best example is the title track. The song takes the proverbial out of the music scene at the time, (though I still think it’s the case today.) How record companies look more for image rather than substance of music. While the message has a hint of seriousness to it, Frank does it in his usual f*ck you style, which has the listener laughing their asses off throughout the entire song. Many other songs have the same effect, “Love Of My Life” springs to mind as it rips on 50s style teenage love songs. He also reworks some of his older songs like “Brown Shoes Don’t Make It” from his time with the Mothers of Invention. As usual, he gets some of the best well known and little known musicians to play with him and he always seems to bring out the best in them. On “Tinseltown Rebellion, guitar legend Steve Vai plays along with some of his regulars like Ray White, Peter Wolf and Ike Willis. So there’s little wonder why the music quality on the album is so high. I have always been a Zappa fan, in fact, I drove some of my marine buddies a little crazy over my passion for his music, although I converted quite a few as well. 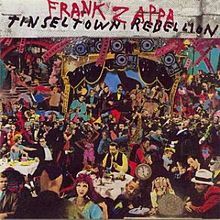 Frank Zappa has many great albums to his credit; “Tinseltown Rebellion just happens to be among them. You are currently browsing the 80smetalman's Blog blog archives for March, 2014.